India needs to intensify its cooperation with neighbors, including China, on the Indian Ocean, amid mounting regional challenges, Chinese experts said on Thursday. "India has long regarded the Indian Ocean as its backyard," said Fu Xiaoqiang, senior researcher with the China Institutes of Contemporary International Relations. "Problems such as rampant piracy have to be tackled under an international mechanism that also includes China, the US and Europe," he said. Apparently, India wants to play a dominant role in South Asia, but it alone cannot safeguard the ocean, said Su Hao, an expert at Beijing-based China Foreign Affairs University. Their remarks followed an Indian navy official's comment on Wednesday that India plans to strengthen its naval presence in the waters off its southern shores. "We have identified what our maritime interests are in the region and we are looking to convert them into capabilities to have control of our sea areas," Vice-Admiral Nirmal Verma told a news conference, replying to questions on China's growing presence, Reuters reported. India's expansion plan was also a result of what the West has touted as a China threat, Su said. "Western media have claimed that China is deploying military presence around India." However, military growth of China and India will not trigger an arms race between the world's most populous nations, both experts said. 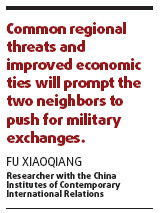 "Common regional threats and improved economic ties will prompt the two neighbors to push for military exchanges," Fu said. A Chinese delegation, headed by Ge Zhenfeng, deputy chief of general staff of the Chinese People's Liberation Army, is now in India, in the latest of military exchange between the two nations. Earlier this year, former Indian navy chief Admiral Sureesh Mehta made the first visit by an Indian navy chief to China. New Delhi's military budget accounted for nearly 2 percent of its GDP last year, but Indian Defense Minister A.K. Antony has said the budget should be pegged to 3 percent in future. China's military spending was only 1.38 percent of its GDP in 2007, the latest figure available from a white paper issued by the Chinese Ministry of Defense last year. Antony said on Monday that Chinese military aircraft violated Indian airspace five times in May and June, the Hindustan Times reported Thursday. China's Foreign Ministry didn't comment on the report Thursday. In response to earlier similar reports of alleged Chinese intrusion on Indian territory, however, it has said China and India have never formally demarcated their land. Beijing and New Delhi have vowed to settle the long-pending border disputes through peaceful negotiations. Antony said the last round of border talks between the world's two most populous countries in August "ended on an optimistic note", India Today reported in October. A defense lawyer for an American student accused of killing her British roommate broke down after urging the court to give his client back her life. Your vote would decide which Chinese song would be performed in Riverdance during its a 13-city China tour. Drew Barrymore arrives for the premiere of the film "Everybody's Fine" in New York December 3,2009. China is a country of rich diversity not only in nature and landscapes. It is best reflected in her 56 ethnic minorities.